June Chamber Social a Huge Success! 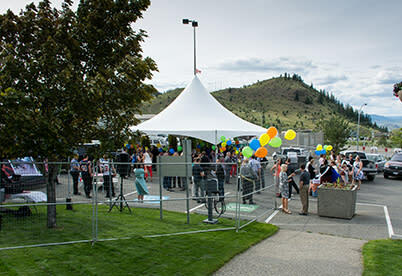 Thank you to everyone who joined us on June 1st as Tourism Kamloops hosted its first Chamber of Commerce Social. The atmosphere was a festive one as we welcomed well over 130 Chamber Members and Tourism Kamloops Stakeholders, as well as special guests Wally Buono, Geroy Simon and Marco Iannuzzi from the BC Lions as well as Brody Bernier and Kieran Muir from the Kamloops Broncos. We would like to extend particular recognition to our event sponsors, without them we couldn&apos;t have put forward such a fantastic event! Tourism Kamloops will continue to look for similar opportunities such as the Chamber Social to bring our stakeholders together!